So I am trying to write a story (as I write this line, I realize that for the rest of my life I will always be able to write this line, and that is daunting and exciting). It is a story that is, to some degree, my attempt at a response to a few of my other stories that come out of my years as a social worker. The working title for the story is "Wish List" and it has been incredibly hard to write because I want it to be a story about solutions to cycles of abuse and still be a story. I ended up putting in parts in italics that were essentially me critiquing my own work but within the story structure and in a sort of gruff, sassy tone. A "what do you think you are doing?" questioning of myself. Admittedly, the story is still in pretty rough shape but I was excited by what I had so I showed it to a few folks here. 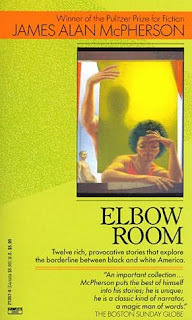 Beth Loffreda insisted that I read James Alan McPherson's "Elbow Room" because in it he does something similar to what I was trying to do, but with much more power and control.I ordered it and flipped to the back of the Pulitzer Prize winning short story collection. It has been awhile since I've been that blown away by a story. It is the kind of work that makes a writer want to never write again AND to write like a fiend in an attempt to catch up. The story is about race in America, about relationships and family, and there is an amazing subplot about storytelling and story taking that is genius. Since that first read, I've read it two more times and made copies for friends. I've ordered his other books and thought about the gaps in knowledge that we all have-- but how could I have missed this writer? Though I know I will read them, I am a little hesitant to read other stories of his because I am scared that they won't live up to "Elbow Room." I remember thinking this about Flannery O'Conner a long long time ago. Even having the privilege to know McPherson, and to have taught Elbow Room in my graduate seminar at Emerson, I feel the same way. See www.pshares.org and his introduction to the fall issue of Ploughshares (connecting Obama to young writers, and on line for free).